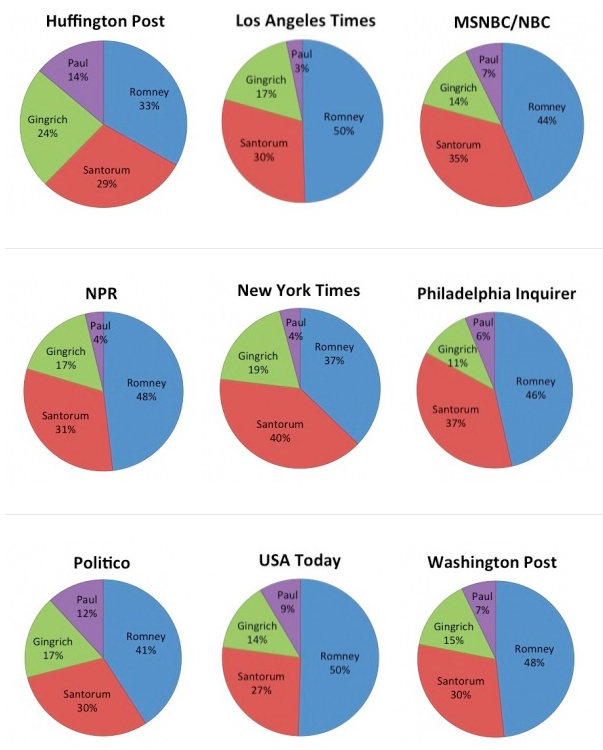 This page provides a summary of research results for the Denver Post’s photographic coverage of the 2012 presidential election. 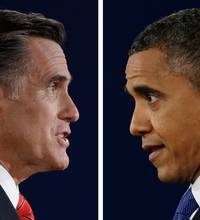 The Denver Post‘s staff photographers took distinctive pictures of the first presidential “hometown” debate on Oct. 3. Those images dominated the Post’s coverage not just of the debate but of the entire week. The Post‘s photos of the first debate emphasized each candidate alone on stage, and focused on their expressions and body language, rather (as was the case with the photos from AP) than on their confrontations with each other. These six images of Barack Obama and Mitt Romney are a sampling of photos published by the Denver Post during the three weeks of the PrezPix study. Clicking a photo links to the Pinterest board of that photo. Researchers pinned a total of 291 photos from the Denver Post over the three weeks of the general election — 122 photos of Pres. Obama and 169 photos of Gov. Romney. Researchers observed the biggest spike in pinning during the week of the first presidential debate, which was held at the University of Denver. The photos from this period counted for more than half of all the photos pinned from the Post during the three-week study. Many of the photos appeared in the multiple slideshows on the Post; most of those photos were taken by the Post’s staff photographers. Researchers found and pinned 40 percent more photos of Romney than of Obama that week; researchers conjectured from the images themselves that that was largely due to the change in the dynamic of the race with Romney’s rise in the polls. Both candidates had relatively low “negatives” across all three weeks of the study — a substantial proportion of the photos every week showed the candidates smiling or confidently speaking to an audience, actions which researchers tended to evaluate positively or at least neutrally. While not observable from overall ratings, researchers noted and coded a difference in who appeared together with Gov. Romney across the three weeks of the study. In almost two thirds of the first week’s images, the photos showed Romney by himself; yet only one-third of the photos in the week of the first debate showed him alone (in large measure because he and Obama were photographed together on stage at the debate). By the final week the statistics had flipped from September: Romney appeared with others — typically supporters or Obama during the second debate — in roughly three-quarters of the photos. The DenverPost.com published most images relevant to this study on its home page and its “Election Hub” section. Those images that appeared as “teasers” on the home page and “Election Hub” section were duplicated when the specific article opened up to its own page. Most photos displayed either as the sole accompanying graphic or in a slideshow format. Every image was pinnable to Pinterest. These six pie charts show the percentage of positive — neutral — negative photos of Barack Obama and Mitt Romney from The Denver Post coded by researchers during the three weeks of the PrezPix study. Sept. 17-23 — Two weeks prior to the first debate, researchers coded more than three-quarters of the photos of Obama published* in the Denver Post as “positive” — half again as many as they coded for Romney. Oct. 1-7 — In the week of the first debate, researchers recorded a significantly smaller proportion of “positive” images of Obama, and the coding of photos of Romney trended more “positive.” The real distinction that week, however, was the greater number of images of Romney found and pinned — 40 percent more than the number pinned of Obama. Oct. 15-21 — The week of the second debate, the trend of fewer “negative” images of Romney continued — although the overall percentage of his images coded as “positive” slipped somewhat from the week before. 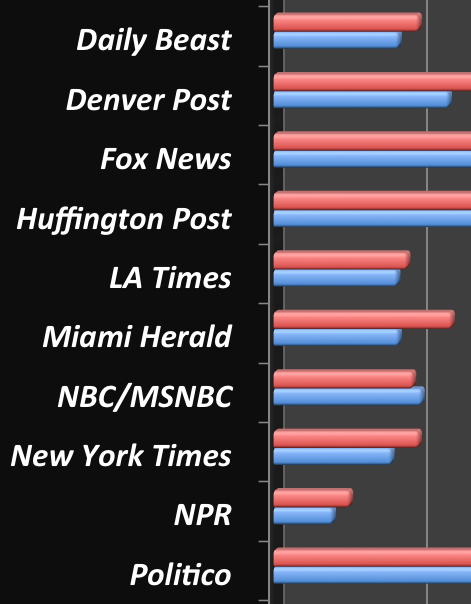 During the 2012 presidential general election season DenverPost.com, hosted most of their coverage in its “Politics” section. The site also had a dedicated “Election 2012” section, but this hub displayed no images – just links to the articles where the photos were visible. In addition to these sections, a reader could also find pictures in the site’s “Photos” tab which would redirect to the Denver Post‘s “Media Center.” The section featured photo galleries for specific campaign events. PINTEREST: DenverPost.com synced well with Pinterest; the main images associated with articles were easily able to be pinned. However, it was necessary to click through every article to find if pictures were associated with that article. The main pages did not contain many photos for the most part. It was also impossible to pin videos and video previews, which detracted from the ability to gather the entire visual experience for a reader. CONTEXT: DenverPost.com is the online home of The Denver Post. The paper is owned by MediaNews Group, Inc. The paper was first published in 1892, and 6.4 million unique users now visit DenverPost.com per month, making it the leading online media presence in Colorado.